Who Was Right About The House Intel Memo: Schiff Or Gowdy? Anyone paying attention to competing political narratives during the two-week lead-up to the release of the House Intelligence Committee memo would have noticed the fundamental disconnect between the opinions of the two congressmen most familiar with the underlying intelligence that informed the memo’s contents. While Reps. Trey Gowdy and Adam Schiff both read the same packet of classified Foreign Intelligence Surveillance Act (FISA) applications the Federal Bureau of Investigation (FBI) and Department of Justice (DOJ) provided, they came away from the reading room with completely different impressions of the story those documents told. 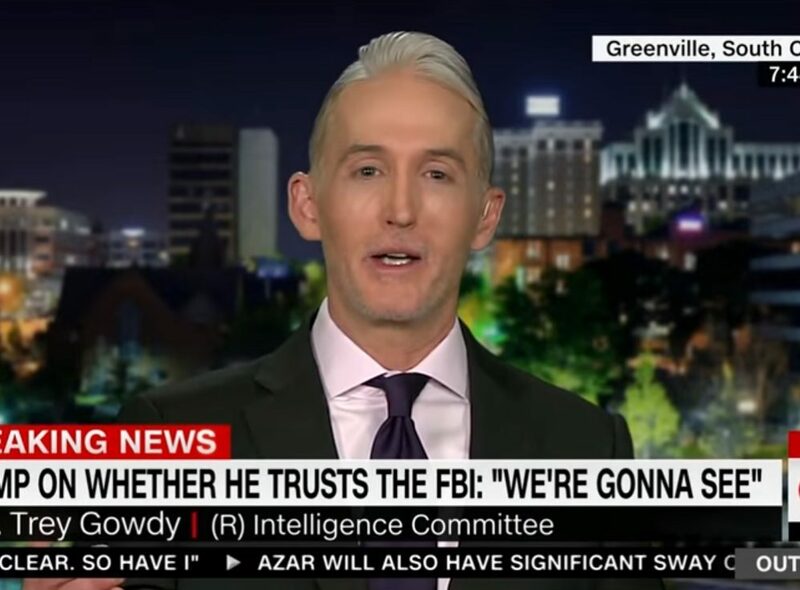 In interviews before its release, Gowdy told us the memo would show, among other things, that the FBI included uncorroborated information, obtained at the behest of a rival political campaign and presented to the FISA court (FISC) as verified intelligence, to obtain a warrant on an American citizen under false pretenses. Gowdy assured us that no classified information would be revealed, and no sources and methods would be burned, by releasing the memo. Schiff, on the other hand, warned us the memo would contain highly classified, cherry-picked, and misleading information, which would reveal intelligence sources and methods that should never see the light of day. He told us that releasing the memo would harm our national security capabilities with respect to FISA procedures, and needlessly undermine our faith in the FBI and DOJ, for no other purpose than partisan political gain. While any number of their colleagues regaled us with breathless predictions of revelations and ramifications multiple levels more alarming than those of Gowdy and Schiff, the absolute nature of their disagreement on reading the same set of facts was enough to tell us that someone was lying. The only question was: who? Those inclined to believe Gowdy’s version found it difficult to believe that a former federal prosecutor with decades of service alongside FBI, DOJ, and other law enforcement agencies would make such incendiary accusations without sufficient foundation. Those inclined to believe Schiff’s warnings found some support in a number of former-FBI and DOJ FISA experts, who almost unanimously guaranteed the inviolability of the FISA evidence-review process, both in the FBI preparation and FISC judge consideration. According to these FISA experts, a cow would sooner fly then an unverified, unevaluated piece of evidence find its way into a FISA request packet, or, in the unlikely event that it did, be allowed as evidence of probable cause by a FISC judge. It simply couldn’t, and wouldn’t, ever happen. The FISA application then travels to the Justice Department where attorneys from the National Security Division comb through the application to verify all the assertions made in it…DOJ verifies the accuracy of every fact stated in the application. If anything looks unsubstantiated, the application is sent back to the FBI to provide additional evidentiary support – this game of bureaucratic chutes and ladders continues until DOJ is satisfied that the facts in the FISA application can both be corroborated and meet the legal standards for the court. After getting sign-off from a senior DOJ official (finally! ), a lawyer from DOJ takes the FISA application before the FISC, comprised of eleven federal district judges who sit on the court on a rotating basis. The FISC reviews the application in secret, and decides whether to approve the warrant. In short, the FISA warrant process is designed to protect against the very abuse of power that the President has accused his predecessor of exercising. You could even say that FISA applications go through an ‘extreme vetting’ process before being granted – something that the Trump administration ought to support. So the argument against the possibility that the FBI and DoJ allowed uncorroborated sections of the Steele dossier to be included in a FISA application is that the system simply doesn’t allow for it. You can tell me it’s in there, but I’m going to tell you it can’t be in there, because it’s not allowed in there. This is fair enough, unless you’ve been listening to former Director of National Intelligence (DNI) James Clapper lately. Recall that Clapper, as the DNI, was the convening authority of the three intelligence agencies responsible for producing the Intelligence Community Assessment (ICA) on Russian interference in the 2016 election—the Central Intelligence Agency, National Security Agency, and FBI. As DNI, Clapper ran that show. These agencies all reported to him as they collaboratively compiled intelligence to inform the ICA. The ICA team began work in December 2016 on a report that was published on January 6, 2017. Clapper has been interviewed countless times on his understanding of the degree to which the Steele dossier contributed to opening the FBI investigation, and, significantly, whether any of the dossier information had been corroborated. Clapper admittedly had and has no idea what role the dossier played in opening the investigation, because he didn’t learn of the FBI investigation until March 2017, two months after he left office. So he can’t help answer that question. The question he can answer, and has answered repeatedly in scores of televised interviews, is how much of the Steele dossier had been corroborated by the time he left office in January 2017. Clapper says he learned of, and read, the Steele dossier in December, when he was working with the IC to put together his ICA. When asked whether any information from the Steele dossier informed the ICA, Clapper consistently gives the same answer, almost verbatim. He says they didn’t have time to validate the second- and third-level sources in the dossier, so they didn’t include that information in the ICA. When questioned further about his knowledge of anything in the dossier that had been validated prior to his departure in January 2017, he repeatedly cites two items: Russian President Vladimir Putin hated Hillary; and Putin wanted Trump to win. So, according the former director of national intelligence, none of the allegations in the dossier about volunteer Trump campaign advisor Carter Page, the subject of the FISA application, had been validated by the FBI when they were presented to the FISA court as probable cause to designate Page an “agent of a foreign power.” It was raw and unevaluated intelligence. Remember, the only parts of the dossier corroborated by December 2016 were Putin’s hatred of Clinton and his desire for Trump to win. Yet the FBI successfully convinced the FISA court, using uncorroborated info in that very dossier, that Page was an agent of a foreign power. Schiff saw the same paperwork as Gowdy did and told us releasing the memo would recklessly and dangerously reveal highly classified information, harm our national security, and reveal sources and methods. He was wrong. Gowdy saw the same paperwork as Schiff did and told us releasing the memo would show that the FBI and DoJ introduced uncorroborated and unverified information, gathered at the behest of a rival political party, into FISA proceedings, with the paid, political provenance of the dossier unreported to the judges. He was right. The FISA experts—all of those former FBI and DoJ lawyers most familiar with the process—repeatedly assured us that federal procedures in place to eliminate the possibility that unverified information would make its way into a FISA court, or survive a cursory consideration by a FISC judge, were so bullet-proof the mere mention of such a possibility was a waste of breath. It’s unheard of, they said. Laughable. They couldn’t have done it, because it can’t be done. The House memo shows that they did. They did present raw, uncorroborated intelligence, they weren’t laughed at, and they weren’t shot down. They got the warrant, and Clapper, Schiff, James Comey, and scores of their colleagues are telling us there’s nothing to see here.